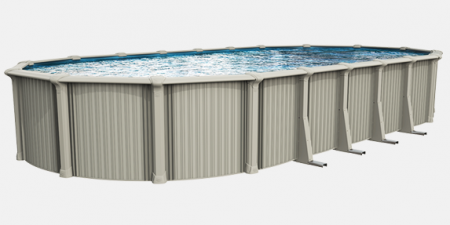 Built for semi-inground installation, the Oasis is our top-of-the-line aluminum pool. Enjoy the advantages that semi-inground installation has to offer – better landscaping, convenient access and a fantastic-looking pool! The Oasis oval pool system is available with the Yardmore Buttress free Oval system. This streamlined system was designed to use less space in your backyard. A structurally simplified design with the superior strength and durability of our traditional construction that is both efficient and attractive.